Here’s something that a lot of my new students have a problem with. They feel OK speaking, but they have big problems understanding people, especially when they talk fast. They also tell me that they don’t have a lot of time to practice listening in English. Here’s the advice I give my students. The best thing? It takes zero effort and takes up no extra time. Put on the radio or a podcast or any English audio while you’re doing something else. You don’t have to focus, listen or understand. It’s that simple. Your device might be more modern than this one. You can do this while you are …. 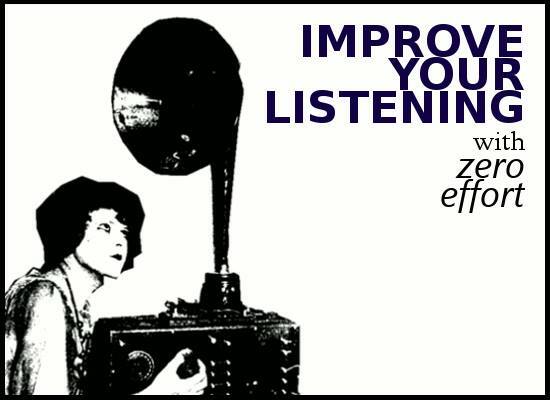 You’ll be amazed at how effective this is at improving your listening in English. Keep it up for 2 weeks and you’ll notice the difference. Here are some free sites to get started with. Choose a site, bookmark it and press play! You’re on the way to better listening in English. Hi, Gabriel. I’m going to put my “listening hat” on here (well, to be honest, I never take it off!) and say yes, there’s a role for this sort of passive listening. But unless you can listen for hours and hours and hours, I’m not sure it pays off as quickly as “getting your hands dirty” with dictations, shadow readings and all that good stuff. But it definitely has a role – we all know that most learners aren’t doing enough listening anyway, so anything that makes them listen more is good. I’ve finally been listening to and recommending the listening project by the way. If they came with transcripts, it would be the perfect listening resource! Yes, I couldn’t agree more! Passive listening by itself would never be enough to get the sort of improvement you’d want to see as a language learner. It’s more about reinforcing your listening skills. Of course everything helps though. I had an interesting experience with one of my students today, actually. He instinctively managed to correct one of his sentences to say “I have family in Rome” rather than “I have my family in Rome.” That error wasn’t the one we were focusing on at the time, but he asserted the correct form. I asked him how he knew that. His answer? From relentlessly listening to The Listening Project (he’s been listening to a few a day for a couple of months now). So yeah, it’s not enough just to randomly listen, but it can “iron out” some of that microgrammar without the need for explicit input. Oh yeah, exposure definitely fixes a lot of problems over the long-term. But I’m starting to see more and more that it’s good to do some intensive work, have a break and then come back to it. A lot of the material seems to sink in in the meantime and is easier to understand when you come back to it. The mysteries of the human mind and language learning! “Passive listening” can certainly improve your language skills, but when combined with focused study, the results can be much more impressive and more than the sum of their parts. It can also help prevent the loss of language skills when we’re too busy to study or practice or have lessons. Which is neat. This one is valuable and practical too. It got me thinking about something. You know how some teachers and English-speakers try to “grade” their language when talking to English learners? They slow down and try to make it easier to understand, but in doing so often come out with unnatural rhythm? I’ve caught myself doing that from time to time and I’ve found that speaking naturally at a natural speed can sometimes be easier to understand for English learners than grading my language as that often results in wonky and unnatural rhythm patterns. Well, it goes without saying that rhythm is very important and grading is quite suitable when the listener feels comfortable. Especially for (very) beginner, I suppose. The adapted literature is the same. On the other hand — you don’t know what is natural until you hear it and a lot. And then, yes, a slowing down may feel like dumbing down or even swindling, sorry. As far as language is concerned, I’d say that “tra-ta-ta-ta” (Russian and Indian rhythm) is not the same as “tum-te-tum-te” (iambic pentameter) — you can’t play the cello on the balalaika and expect the satisfaction from it. I would even go so far saying that we breathe differently when we talk. And the wushu here is poetry. Not the naphthalene for Bob sake, but the light verse — the limerick for example. The stuff for learning by heart and having fun. Awesome — those simple four lines really help. Also — it’s morbidly funny! So that helps you remember it more I guess. Never underestimate mnemonics! Gees, I goggle with disgusted eyes at a drivel I’ve set down the night before (in the beginning)… and I used to like that expression… nothing but nothing except silence or mimic/gesture goes without an utterance for one’s not a telepath… (Jimmy Carr was once right). And even if it’s a question of reinventing the wheel or an old cliché — you should always open A Secret De Polichinelle — witch is, btw, the most difficult part in languages.Sorry.